In order to save time and accommodate a wider range of products, more and more pharmacies are turning to computer controlled, automated dispensing systems. Gollman GMbH, based in Germany, have developed two picking systems for pharmacies; GO.compact and GO.direct with the aim of achieving the largest possible storage volume on the smallest footprint. Go.compact and Go.direct are compact and flexible automatic pharmaceutical cabinet systems that load, store and pick individual items of medicine. One of the key advantages to the pharmaceutical industry is that the systems can store more items in a compact space, therefore providing pharmacies with a competitive advantage to stock a wider range of products. The smallest picking machine, for example, has a base area of only 3.12 square metres, yet can hold approximately 4000 items. Additionally, the systems are time-saving as the pharmacists do not need to be involved in the picking of medicines. The simple, compact bearing system combined with the hybrid gripper technology ensures that the medicine packs are safely inserted into the system and then transported from the system to the customer in the pharmacy. 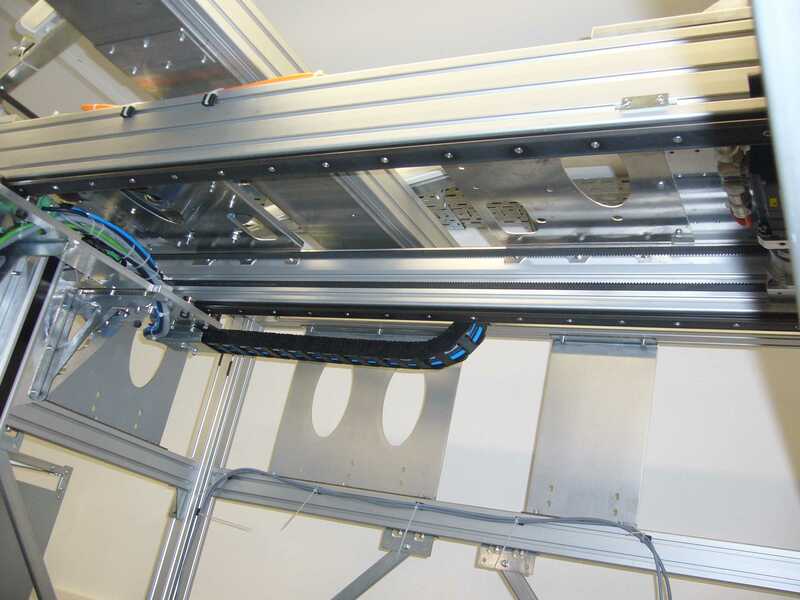 For the smooth operation of the gripper arms, the smart rolling cabinet systems use low maintenance GV3 guides from HepcoMotion, specialists in linear guide systems. 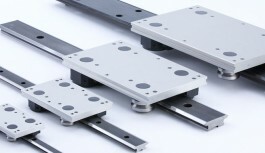 As smooth movement is a key requirement for this application, Gollmann GmbH turned to linear motion expert HepcoMotion, with whom it has been working with since 2009. Hepco’s GV3 linear guide system plays a pivotal role, leading the 60kg gripper arm between the roller cabinets so that it can reach the packs of medicines. 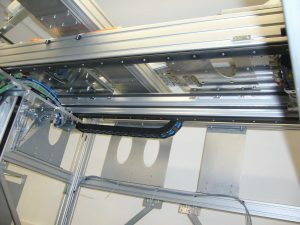 The two parallel, induction hardened GV3 slide rails are based at the top of the system and enable the arm to move smoothly between the roller cabinets. The latest hybrid gripper technology on the gripper arm ensures that the packs are safely inserted and re-stored. GV3 is one of the quietest linear systems available; a key benefit that appealed to Gollman as the systems are in close proximity to both customers and pharmacists alike. The roller cabinets containing all of the different medications also move on a GV3 system, which provides a reliable and smooth movement. The medicines are released from the roller cabinets via an internal conveyor belt, as well as by means of slides or conveyor systems into the cash register area, which takes only a few seconds. It is therefore very quick for the customer to receive their medicine. After over 8 years, Daniel Gollmann, Managing Director of Gollmann GmbH, is still impressed by the Hepco linear guidance systems. 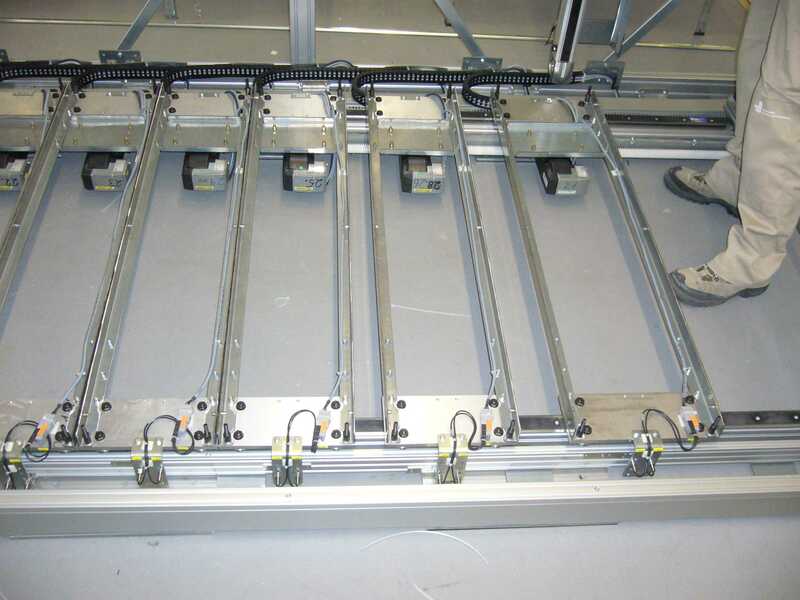 “The Hepco products – we use rollers and rails – work very well, even for a very long time. So we are very satisfied”. Gollmann continues; “We opted for Hepco because we were looking for a track which can fit into our small space and still has the appropriate guiding qualities to accommodate the loads we have mentioned.” Another reason for using GV3 is that the system can run dry, without lubrication. “We needed a dry guide, which does not cause any transfer of grease and dirt into areas where there are sensitive medicines. That was the main reason for us”. Mark Völkers, Technical Sales Manager for Northern Germany at HepcoMotion, explains another advantage: “The GV3 slides are self-cleaning. Although this application may not seem as hostile as many of the applications our slides are used in, the presence of fine packaging dust can create wear. GV3 is very tolerant of debris thanks to the geometry between the V guide and the V bearings, which has a ‘mill stone effect’ caused by the different peripheral speed inside and outside the V form. The difference in speed causes particles of debris nearer the centre to move outwards towards the periphery, and to be expelled. So when the trolley moves, any fine dust or debris from the pharmaceutical packaging which has accumulated on the rails is simply wiped clean by the V bearings moving along the slide system. This makes them low-maintenance and keeps the system running and reliable”. Low maintenance is another key driver for the specification of Hepco’s GV3 system, as pharmacists strive to avoid inconvenient downtime which impacts on sales. When a Hepco V guide rail shows signs of wear, the eccentric adjustment facility of the V bearings can be used to quickly and simply remove any play that has occurred. When the V bearings reach the end of their calculated life, they can be replaced individually, and not as an entire set, so perfectly good components do not have to be discarded unnecessarily. Gollmann GmbH now equips over 200 of its automated pharmacies with Hepco’s GV3 system. 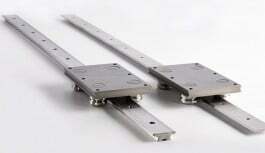 The roller cabinets move on a GV3 guide rail from HepcoMotion. The GV3 guide system can run dry (without lubrication) and is self-cleaning thanks to the V guide technology. 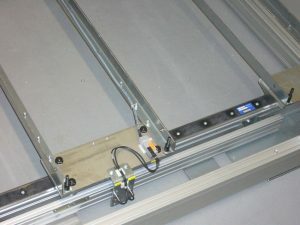 Two parallel running induction hardened GV3 steel rails lead the 60 kg heavy gripper arm (not shown) between the roller cabinets.